The handsome, monied Great Gatsby in the famous movie of the same name dressed as one, so did his Wall Street banker friends and such swashbuckling silent movie actors as Douglas Fairbanks. 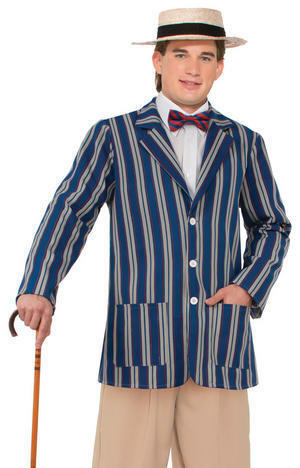 As far as we can gather here at fancydress365 the 'boater' character was trending, fun, young'ish and from wealthy stock. He could be found strolling along the boardwalk with couples, cane in hand or enjoying the view off-shore on a friend's yacht. As well as the cane, a thick hand-woven straw 'boater' hat was also de rigueur. 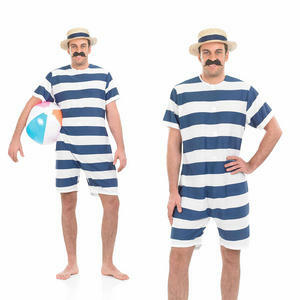 Later the 20s boater fancy dress outfit was a costume adopted by Barber quartets everywhere in the States - so if you and your friends fancy setting up an Accapello band this could rate as one of the easy group costumes around. 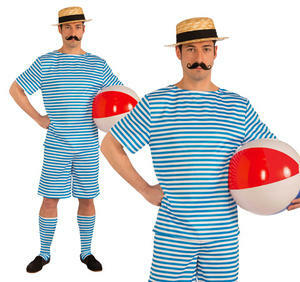 Since it was regarded as a summer only outfit, the jacket of the boater was light coloured (usually a red and white striped blazer or light blue and white version) and of a thin fabric. The wearing of the straw hat became emblematic of summer and was traditionally stamped on at the onset of autumn. In fact, New York in 1922 witnessed an eight day Straw Hat Riot, resulting in plenty of arrests!